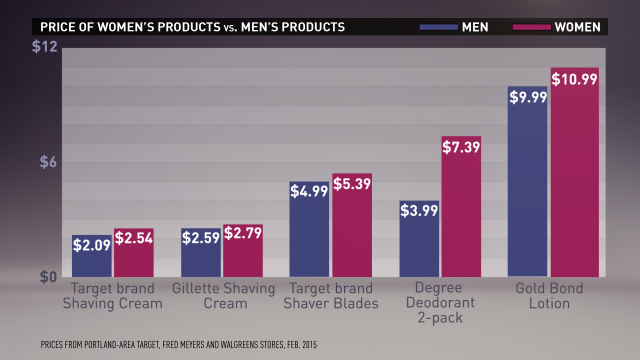 Graph showing the price disparity between men’s and women’s hygiene products. $6.20 for razors. $1.50 for body wash. 85 cents for shampoo. 2 cents per unit for tissues. These are the differences in price between similar men’s and women’s products in the UNC Asheville bookstore. A few pennies may not seem like much, but when it is the cost of being a female, it begins to add up. Frankie Keller, a sophomore history major from Charlotte, said she is familiar with the concept. “From my understanding, the pink tax is the fact that products women have to use for basic care or whatever, like pads or razors or things that are typically marketed to women, typically also cost more,” Keller said. This may sound like a classic example of blowing an isolated incident out of proportion, but the facts are starting to back up the claims. According to a study published in the December 2011 edition of Gender Issues, research suggests women do tend to pay more than men. The products and services that cost the most tend to be those highly gendered or serve to clearly assign gender to a body. The study also reported no federal laws preventing pricing discrimination based on gender, although California, Massachusetts and New York City do have laws prohibiting charging men and women different prices for the same service. Keri O’Hern, a sophomore drama student from Autryville, North Carolina said she sees evidence of discrimination in free distribution of gendered products. Condoms are frequently freely offered by health services such as the UNCA Health and Counseling Center, pads and tampons are not. This plays a part in why the pink tax hits college students particularly hard. The UNCA bookstore is not free from price discrimination either. Out of 10 products analyzed, four had higher prices for being marketed toward women. Five items marketed toward females contain less but cost the same or more as their male-marketed counterparts. Stephanie Todd, a sophomore student from Raleigh, was not happy to learn this. “I was not aware of that. I knew that, like, razors and such for females cost usually, but I didn’t know that,” Todd said, shock playing across her face. There seems to be a common theme in the reasons thought to be responsible. O’Hern said she believes the people in charge, who tend to be white, cisgendered and heterosexual males, capitalize on women and other minority groups. Keller said it’s the fact society doesn’t require as much from men to be accepted. According to the study from Gender Issues, some researchers say gendered pricing differences serve to reinforce traditional thinking and stereotypes about gender. Whatever the cause, to combat this, some women are switching to men’s products. O’Hern said she buys men’s razors and similar grooming products because they are cheaper and tend to work better than their female-marketed counterparts.